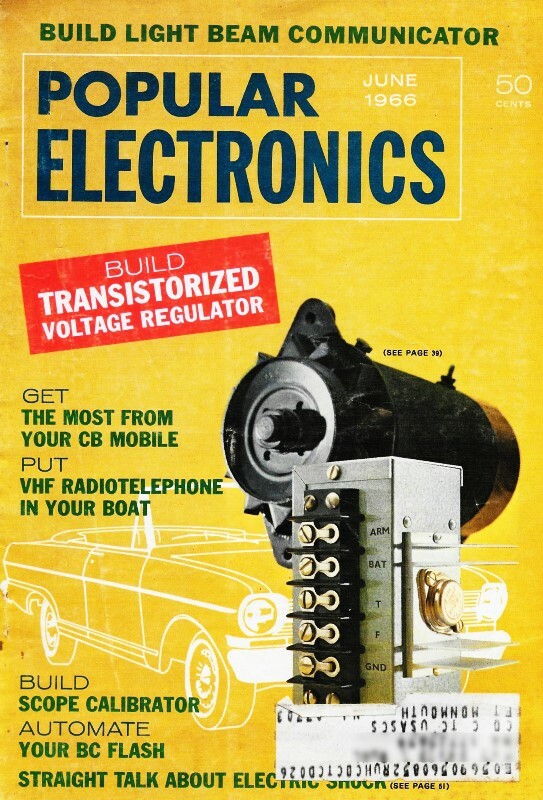 Robert Radford's (not to be confused with Robert Redford) "Electromaze" is a unique - and weird - sort of word puzzle that first appeared in the April 1966 issue of Popular Electronics magazine. Some people were confused about the strategy, believing that all the white spaces needed to be filled in. They do not. Just because a letter might have an empty square adjacent to it does not imply that another letter must fill it. You will probably want to print out the maze grid and find an old guy who should still have a pencil stowed away somewhere you can borrow to use for filling in the boxes. 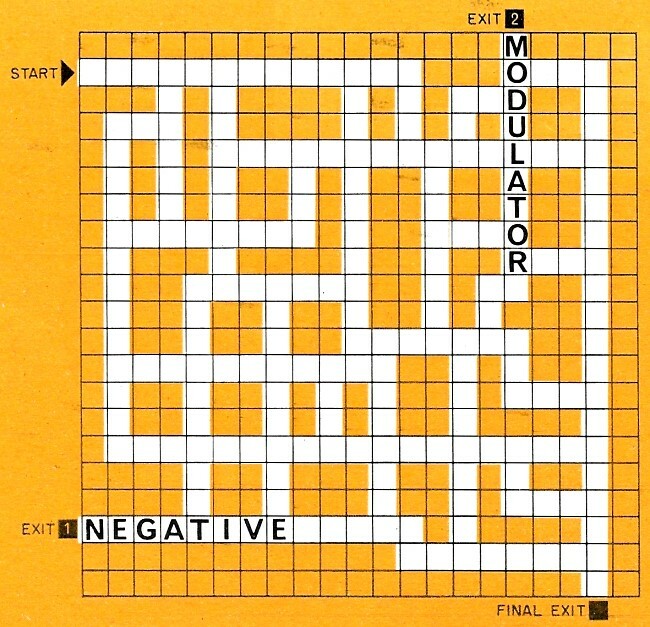 Here are the February 1966, April 1966, and June 1966 Electromaze Puzzles. 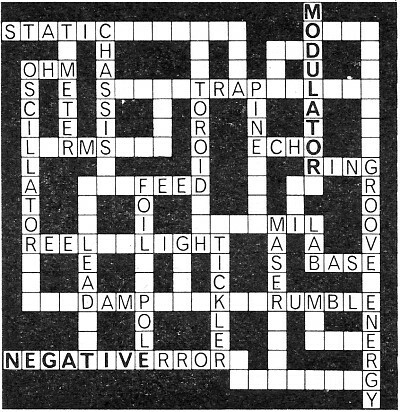 Here's a new kind of crossword puzzle designed to test your knowledge of electronic terminology. Refer to the clues given and fill in the word called for by the first clue. Start at the arrow. 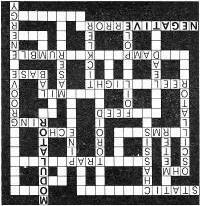 Thereafter, fill in each new word called for by the following clues perpendicular to each preceding word. The first or last letter in each preceding word will be common to the first or last letter of each new word, and all words will read vertically downward or from left to right. The tenth word will have a letter in common with the word at the first exit. Nine more correct entries will take you to the word at the second exit, which will also share a letter with the last of these nine words. In each case, the first or last letter of the exit word will be the first or last letter of the next word. An additional nine correct entries will put you at the final exit for a perfect score. A correct entry may or may not fill up all of the white spaces available. 1 Noise in a radio receiver, sometimes caused by atmospheric conditions. 2 Metal surface on which electronic circuits are mounted. 3 Abbreviation for the effective value of an alternating current or voltage. 4 .Instrument for electrical measurements. 5 Unit of resistance measurement. 6 Synonym for a sine-wave generator. 7 A revolvable device on which recording tape is wound. 8 Conductor used with test equipment. 9 To hinder or prevent oscillation or vibration, such as the quivering of a meter pointer. 10 One end of a bar magnet. Exit 1. Polarity resulting from excess of electrons. 11 Voltage representing angular difference between shaft position and stator of a svnchro control transformer. 12 Series-connected coil in on electron tube plate circuit, providing feedback to grid through inductive coupling. 13 Visible form of energy. 14 Thin sheet of copper or other metal, often bonded to phenolic boards. 15 To supply a signal to the input of a circuit. 17 Circuit that rejects undesired signals. 18 Wood used for making speaker enclosures. 19 Signal reflected by a distant target to a radar screen. Exit 2. Device for mixing carrier frequency and signal frequency to produce sideband frequencies. 20 Negative or battery side of a telephone line. 21 A long, narrow channel or depression. 23 Scientific research/development center (abbreviation). 24 Unit of length equal to one-thousandth of on inch. 25 Microwave amplification by simulated emission of radiation. 26 Undesired low-frequency vibration, usually associated with turntables. 27 May be transformed from one form to another, but usually cannot be created or destroyed.